Hey there, pals! There's a new version of Sprytile out today, with a few features that enhances the Sprytile workflow. To get the latest version of Sprytile, you can use the updater found in Sprytile's preferences or manually reinstall the addon from the latest download on itch. The big new feature of Sprytile 0.4.3 is Auto Padding. 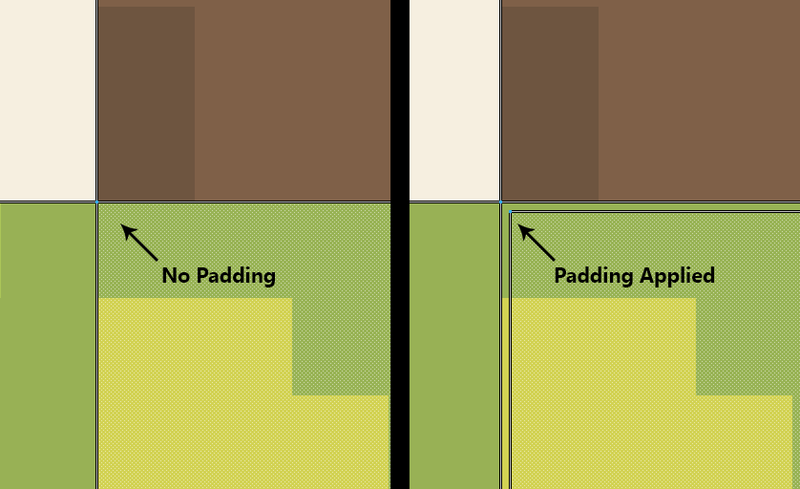 This automatically adds subpixel padding to tiles and address the tile edge bleeding issue that more users seem to be coming across. This has the draw back of technically not being pixel perfect but the effects are imperceptible at most pixel scales and you won't have to add padding in your image editor. If you're working at a scale sensitive to the effects of subpixel padding, this feature can easily be disabled and there are options to control the amount of subpixel padding being applied. Thanks to user josephsilvr for bringing this idea up! Feedback on Sprytile is more than welcome, please feel free to post in the forum. The tile selection UI got some polish this iteration as well. In 1x1 grids, there is now readout of the selection size, making it easier to use. You can also move tile selections around by holding down the ctrl key and moving the tile selection with the left mouse button. With this new feature release, I'm also launching the Sprytile Patreon campaign. Building Sprytile has been fulfilling endeavor and I'm so happy that it has helped people take their first steps into 3D. A significant amount of time goes into working on and supporting Sprytile, and it would be amazing to be supported in this. If you'd like to help with Sprytile's continued development, please consider becoming a Patreon supporter! You'll get behind the scenes posts on Sprytile and at certain levels you'll get access to tilesets and Blender files that I make in the process of working on Sprytile. If there is enough support for the campaign, it will feed back into the community as well with the first big goal of getting a hosted forum for Sprytile! If you aren't in a position to support a Patreon, I totally understand! You can also help support Sprytile by leaving an honest rating on the itch.io page or by posting the art you create with Sprytile on social media. Thanks for any support, and have fun with Sprytile! If you'd like to get to know the community or get help with Sprytile, the Discord chat server is the place to be!